$149 – ‘Seven Days Ad Special’* March special. Hospitality – Now, Spring, Summer Fall Reservations. A resort client of our runs record seasons. Real Estate – Make many more targets buyers aware of your real estate offerings. Any price range. Luxury is a specialty of ours. Shopping – Put your shopping experience of their list. Employment – We can help you target a reach out any level of employee. From executives to managers. Many may not be ‘looking’ but when presented with a great opportunity in a great community, well magic can happen via our digital network. Experiences – You provide an experience and we’ll let America know about it. Dining – Tempt their taste buds from afar as they dream of their next visit. Just $99 a week if you buy a pack of four weeks in one transaction. At just $149 a week or $21.29 a day for 1000’s of targeted digital ads broadcast and pulsated out nationally to an interested audience. The best part is that this are interactive ads with live links back to your offer, product, service. Offering the benefit of the best of both worlds. The right customers are able to react in real time 24/7 to your ads and they also have the added benefit of building brands awareness. *Each special includes ‘THOUSANDS’ of interactive ads personalized to your offer. Designed, programmed, targeted and pulsated out over seven days of targeted, our network of 10’s of thousands Door County enthusiasts locally, regionally and nationally on most any digital device. Mobile to a big monitor. Limited time offer. Regular on season rate is $299 week**. **See below. We’ll work with national and regional agencies that want to leverage our national branded digital broadcast channel. Ask about our agency rates. Effective? Yes. The benefit of your ads presented through our branded network make them extra effective. A traditional resort client has been having records summers (even record May’s), we brought over 4,200 interested parties to a recent auction for a local mansion, we help a local author sell books, local entrepreneurs sell clothing, prints, artisanal soap… We can help get most anything you offer in Door County in front of an interested audience. Compare rates. A local radio station is running a ‘special’ for $200 a day. Local paper? $212.50 for a 3 by 5 col inch ad one day! Our March rate just $149 a week special! Even our reg. rate of $299 a week is just $42.72 a day for some very powerful marketing! Over 35,000 + growing opt-in Door County enthusiasts who want to know about Door County offerings and events. 99% of Door County lovers not here 99% of the time but we can reach them wherever they are and get them interacting with your business. High engagement. Effective affordable rates. Build brand awareness and generate target rich sales leads. 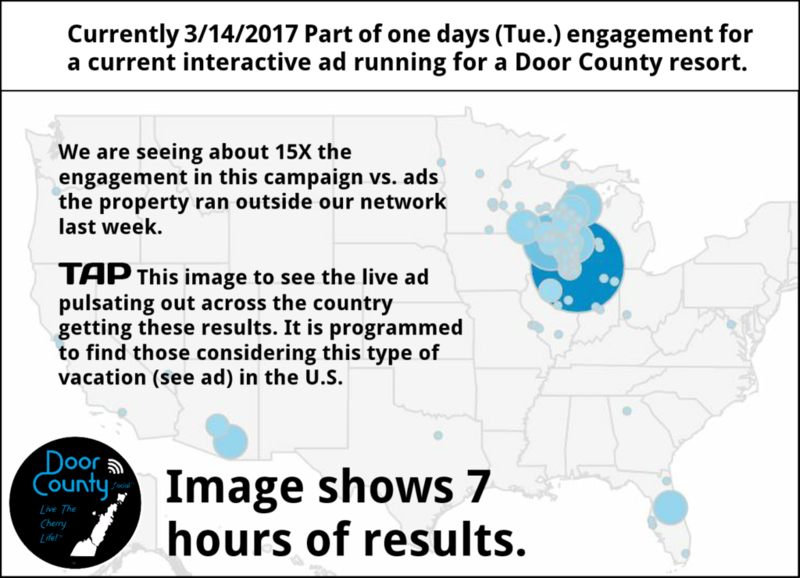 Our experience shows that ads presented through our network with Door County branded icons and massive opt-in audience show a much higher engagement rate than ads we run (as trial w/o DC branding) by individual businesses. Target your ads by, interests, location, income level, and other demographics. Promote your stay and play options, winter specials, grand opening events, spring and summer reservations, sell tickets, products, experiences, real estate (in any price range – click to see how we brought qualified traffic to a local mansion auction in Nov. (over 4,200 filtered visitors) and more. Traffic pointed back to the site of your choice. Ads can be running within a few hours from an agreement. SPECIAL REGIONAL/NATIONAL 2 WEEK AD PACKAGE. Pulsated out across the country to people who have shown interest in Door County. Formatted for mobile, desktop, even Smart TV’s! 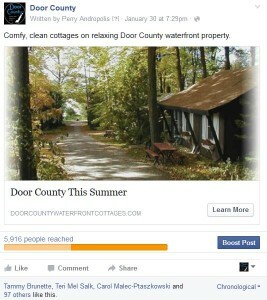 Over 35,000 Door County lovers engage with our marketing channels, nearly 3x local newspaper reach! And depending on ad buy we can possibly reach 100’s of thousands more. With a like audience target. One client we buy and program ads for has a national target base of 800,000 people. Current campaign for local resort – clients web traffic increased 862% in a six day period. Just a couple emails and we can have you running a national targeted campaign. Why use paid digital marketing for your efforts? Did you know with Facebook for example, your organic posts (content you post with out any money put into Facebook ads programs ) reach (according to industryexperts) approx. 2 – 11% of yourpage likes. Facebook is very powerful, probably one of the most powerful effective (paid) marketing tools out there but if there is no money being put in your Facebook campaign very few will see it much less interact with it. Using our attractive Door County branding on our ads co-presented by your business with your offering and with money behind it garners a high level on attention and interaction. There is a lot of competition for the tourist dollar across the region and nation. Along those lines it seems a new event or festival is being conjured up somewhere in the nation each week. So consistent modern marketing is very important. Some opportunities require planning way ahead some could be presented just before the weekend, some of our marketing could be used create top of mind awareness – all products are presented with live links for real time customer lead generation 24/7. 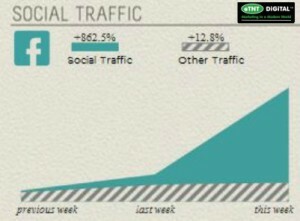 An example of results.. Notice is stats where traffic came from. This local property is headed for another maxed out season. Note during this campaign presented to those who have opt-in into our channels over 84% of traffic came for our efforts, Less than 3%( 2.38%) from the Chamber and 3/4 of one% from the St. Bay vis. center. And 84% of engagement was on a mobile device. Engage with us today. We can bring near real-time results for you. Chose a product, email Tracy, she’ll send you a Paypal invoice, upon payment, your pictures and ad/offer-info will be programmed ‘targets’ of your choosing and placed for network approval and results starting within about 2 hours. We just need pictures, video, and brief info about ad offer.. Contact tracy@etntdigital.com (920) 256-1951 Leverage our authentic and large base of Door County enthusiasts nationwide. Your interactive ads can be running and driving results in hours! Note: We are looking for a independent sale rep. contact Tracy for more info. More detail about us and our leading innovative efforts. The future has arrived it’s just not widely distributed yet! We can help with that with our leading innovative products. In the old days you could reach an audience via radio or paper. Here in the 21st. Century it’s a digital world. With the amazing digital tools employed by our agency and the large network of opt in Door County enthusiasts we have accumulated of the years and our leading and unique products we offer very effective products. We guarantee our paid products will generate leads for your business/efforts. We help you market in a modern world. We are and have been the innovative leader in digital marketing for a select group of properties for years. On board we have business owners that have bought media for 25+ years. They have a mix of traditional media and extensive digital experience and have designed these marketing channels and products for maximum results, the kind they would expect as buyers. In 2005 five we starting a community blog for Door County. Too early? In 2008 we started the first Door County general interest Facebook page. It has grown organically and has a highly engaged audience that anticipates the content we present to them. The power of Facebook as a marketing tool. Facebook is worth more as a company then all the newspapers combined in the U.S. Revenue is doubling while paper newspapers are declining fast. A leader.. Since 2012 we have presented Door County branded interactive ads thorough our digital Door County channels and have much success. A sure sign of success is to be bench-marked (copied). Our interactive ads can pulsate out to all known devices to man (and woman) from big flat screens to mobile. Part of campaign that pulsated out for just over a week in May. This property enjoyed an off the charts record May. How do you reach them? Easy! 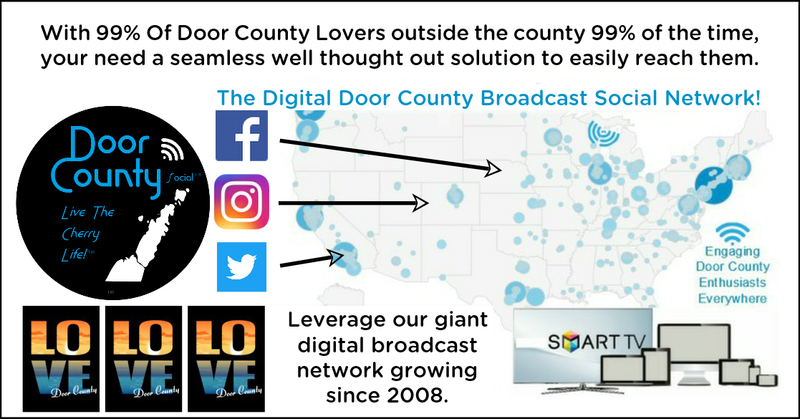 Leverage The Door County Social ‘Broadcast’ Network. Opt-in audiences we have been accumulating since 2008. A giant opt-in group of Door County enthusiasts all across the region and country. This network includes a combined 10’s of thousands of Door County fans via our Facebook, Twitter andInstagram channels. The ‘interactive communication tool’s of our time. We make it very easy. In the old days you could pick up the phone and order a weeks worth of radio or prints ads reaching a purely local audience. Now with our digital broadcast network you can call or email us and within hours your interactive ads will designed, programmed and pulsating out to Door County enthusiasts regionally and/or nationally. Offering near real-time lead generation. Reach your customers through these interactive ad tools wherever they are! Whether at work, at home, at the cafe’, working out, dreaming about Door County and planning their next visit. Reach them during their visit in Door County or even on the way. On any device! DIGITAL MOBILE AD CAMPAIGNS – HOW IT WORKS. For example it’s Wednesday and you have 5 rooms available. You could put you interactive ad/offer out within 2 hours. Powerful targeted lead generations by demo and interest and area of preference. Looking ahead you see only 65% of you tours or SUP lessons or sailing excursions are booked. You could put you interactive ad/offer out within 2 hours. Powerful targeted lead generations by demo and interest and area of preference. Local, regional and/or national targeted, digital ad campaigns. You interactive ads are presented through the Door County Social Network™ with a call to action button linked directly to your business allowing people to..
Over 30,000 Door County enthusiasts. This is an self qualified interested audience. Depending on the ad buy we can reach many thousands more on top of that. Put this powerful digital network to work for your business. Reach a Door County enthusiastic fan base that is not possible to reach via print or radio. Affordable and very effective. 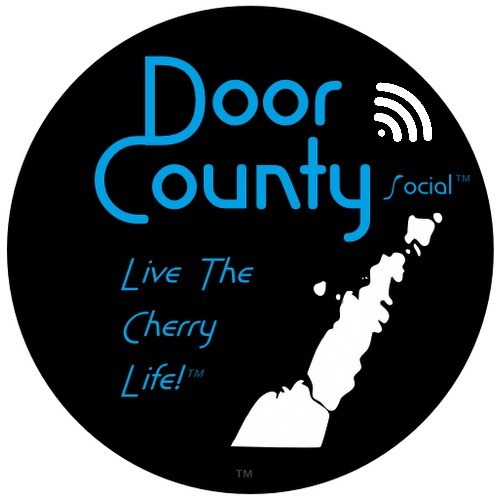 Use an ‘agency’… tell them about The Door County Social ‘digital broadcast’ Network products. Have them contact us today. ACTUAL RESULTS FOR RECENT MOBILE ENABLED ADS. 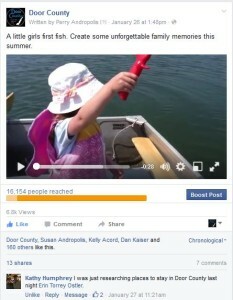 A VIDEO AD FOR A LOCAL FAMILY RESORT PRESENTED THROUGH OUR NETWORK OF DOOR COUNTY ENTHUSIASTS. SEE PAGE TITLE AND ICON. GET EXTRA ATTENTION. FACEBOOK MOBILE NETWORK AD RESULTS. This ad, 1 or 6 for a local resort was presented from and promoted through the Door County Social Network which includes over 29,000 people. It reached 5916 in two days. Generating almost immediate click-throughs – to the resorts website. Those totaled about 300 in two days. Over 85 % came from our campaigns. <1% each from the two area visitors organizations during that same period. PLACE YOUR ORDER TODAY AND HAVE ADS RUNNING NATIONALLY WITH RESULTS TOMORROW! WHY THE DOOR COUNTY SOCIAL NETWORK FACEBOOK CHANNEL? ABOUT 35,000 DOOR COUNTY ‘ENTHUSIASTS’ AND GROWING IN OUR FB NETWORK. THIS IS THE ORIGINAL DOOR COUNTY FB PAGE. ON AVG. IT HAS ENJOYED HIGH ENGAGEMENT NUMBERS SINCE IT’S START IN 2008. WE CAN REACH MULTIPLES OF THAT NUMBER DEPENDING ON AD SPEND. YOUR AD IS PRESENTED FROM DOOR COUNTY AND AN ATTRACTIVE DOOR COUNTY ICON IS USED TO CREATE AN EXTRA LEVERAGE OF ATTRACTION TO YOUR AD. OVER 1.5 BILLION ACTIVE MONTHLY USERS IN THE FACEBOOK NETWORK. WE CAN ALSO PRESENT AND LEVERAGE YOUR AD THROUGH THE INSTAGRAM CHANNEL. THIS FOR NO ADDITIONAL CHARGE AT THIS TIME. 400 MILLION PEOPLE ARE ON INSTAGRAM. WE INCREASED OUR AD SPEND THROUGH THIS NETWORK BY OVER 300% IN 2015. SEE OUR BLOG POST. JOIN US AND GET LEADS NEXT DAY. Some of our digital broadcast ad buys have shown about 90% of those engaging with our ad platforms have been on mobile devices. WE CAN REACH ALL DEVICES. Truly marketing in a modern world! (Stats shown are from a actual short ad buy.) With some research showing that people check their smart phones about 150 – 200 times a day it makes sense. See our related blog post. They are programmed to pulsate out to Door County enthusiasts regionally and nationally. Demographic targets of your choosing, utilizing these very effective, pulsating interactive ads that reach people where they are – at work, at home, on the go, in a purse, in a hand or on a hip. It is not possible to reach this national fan-base with print or radio. Have a presence in the ‘mobile’ present and future! From a recent ad buy.